Finally, time to leave! During the past couple of months I’ve rebuilt my bike, put together the smallest and lightest means of blogging from the road that I could come up with, painfully figured out how to use it to upload both text and photos to my blog, and of course, completely neglected the need to train. Until this morning, I’d done only about 150 miles this year. Last year I totaled about 3000, so although I’m not going to fall apart on this ride, there may be some suffering involved toward the beginning. I got away about nine in the morning, and my rebuilt bike felt good immediately. Fairly soon, though, I needed to adjust the rear derailleur. Not a big problem. So I headed down to the BART station at the Embarcadero to catch a train to Oakland, as the only bicyclable routes across the bay - the Golden Gate and the Dumbarton Bridge - would have taken me way out of my way. 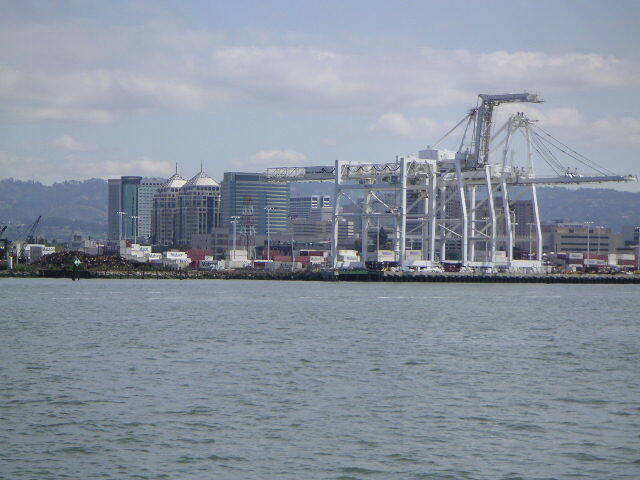 But once downtown, I realized that I had never taken the ferry to Oakland. I had to wait a while for the next ferry though, so I got to Oakland about eleven. After a quick ride over to my old neighborhood near Lake Merritt, I headed up Trestle Glen Road and then up Shepherd’s Canyon Road. That was when I realized that I wasn’t immediately going to take to climbing with my touring load of 45 pounds or so. Down through Moraga (lunch stop at a deli where I used to eat a lot when I lived in Oakland and did east-of-the-hills rides) and east through Walnut Creek. Then I had to climb Ygnacio Valley Road, and I really began to feel it. Then Kirker Pass, where I started to feel really wiped out. There were a few rest stops going up Kirker pass, in fact. But from there, it was completely flat through Antioch and across the delta on the Antioch bridge to Brannan Island State Park near Rio Vista. I set up my tent, took a hot shower, and put my new Brasslite alcohol stove to the test. I bought it to replace the big backpacking gas stove I’ve been using for years, the Whisperlite International, which in addition to being heavy and ungainly, is dirty and sounds like a blowtorch. The alcohol stove is tiny, weighs a couple ounces, is disconcertingly silent, and worked perfectly tonight. So far, I’m very happy with it. Dinner was freeze-dried beef strogonoff. Not bad, but in the future I need to put some effort into buying high calorie food on the road when I’m not going to be eating in a restaurant. And now I’m in my tent, typing this by candlelight on a Palm Tungsten T3 with a folding full-sized keyboard. So far, so good. The moonlight woke me around five in the morning, but I dozed until eight, finally dragging myself over to the shower house to wash and shave. All that I had immediately available for breakfast was some steel-cut oatmeal that I’d bought in a hurry at Trader Joe’s. So I fired up the stove again, this time noting that the wind is a much bigger factor with this alcohol stove than with my gasoline stove. The windscreen was crucial, even though the wind wasn’t very strong. And I need to get some instant oatmeal, as what I have takes five to ten minutes to cook. Leaving, I was stopped by the ranger who was driving by, making his morning rounds. He wanted to make sure I’d paid the biker/hiker rate (for this park, two dollars) and not the full fifteen. I had, but I’d guiltily taken one of the full-size campsites rather than trying to find the dedicated biker/hiker campsite that some of the California parks have. But this didn’t bother the ranger. And here was a man half my age, obviously fit, telling me that he did a little riding with his wife on a tandem but that he just wasn’t capable of doing something like a cross-country trip. I know I’m going to hear that a lot over the next few weeks. In fact, this is something pretty much anyone can do if they start out slowly. 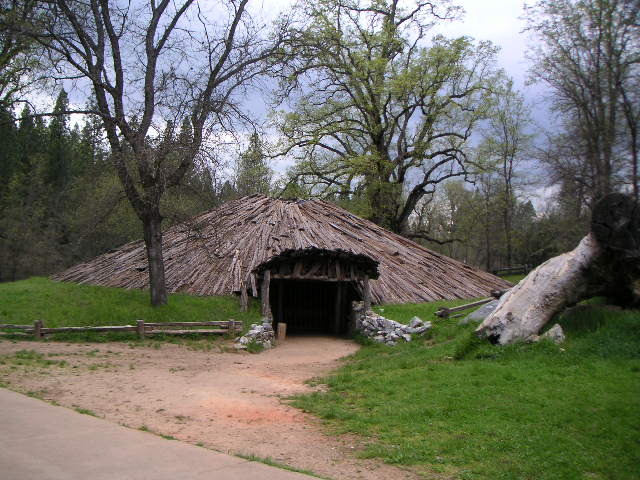 From the state park to Lodi was dead flat, at first across delta land and then across the central valley. I did have to climb approach ramps up to two drawbridges across chunks of the estuary, but that was it. 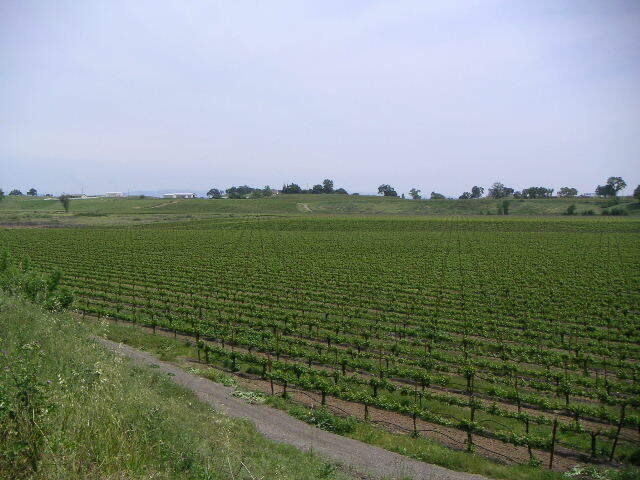 East of Lodi, the terrain changed to a more somber green, there were vineyards everywhere, and I started seeing hills in the distance. 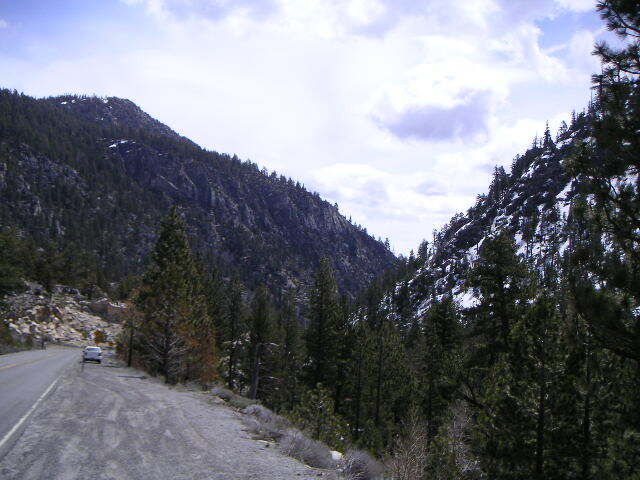 Then the climbing began into the Sierra foothills. Very soon I was really feeling it. Have I pointed out that I’m not really very fit yet this season? I was feeling pretty dead pretty fast. My goal for the day was Indian Grinding Rock State Park near Pine Grove, but I began having dreams of a motel room, the sooner the better. So after several miles of grades on which I was doing five or six miles an hour, I pulled into Martell, at 1500 feet (1000 feet and twelve miles below Pine Grove), and checked into the first motel I saw. Well, this isn’t supposed to be a death march, is it? Dinner was some really bad mu shu pork at a Chinese restaurant - the only other reasonable choice within walking distance was what the motel owner described as “an upper-class Denny’s.” As I’m probably going to be seeing too much of that sort of thing over the next couple thousand miles, I went with the Chinese. I had planned to take tomorrow off, spending it resting and recovering. I’ll probably do the twelve miles to the state park and take it easy for the rest of the day. 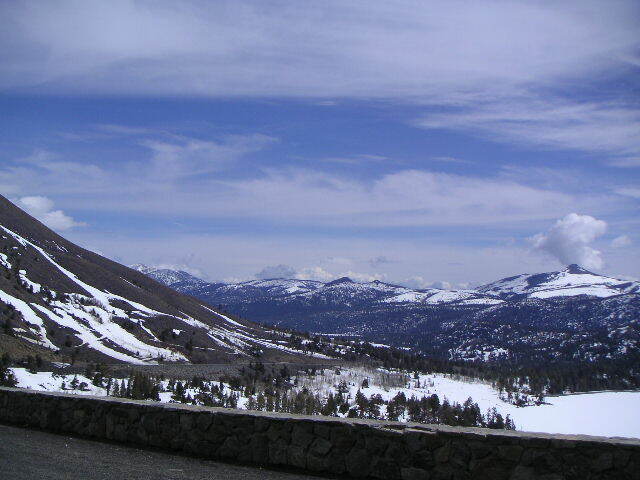 And I’m likely to be forced to take the next day off, as there’s supposed to be some bad weather that may involve snow at Carson Pass. I got up comfortably late this morning and walked down the highway to have some french toast. Re-loading the bike after a motel stay is easy; I haven’t unstrapped the tent and sleeping bag from the bike and generally there’s no need to take the panniers off, either. So I was checked out and on the road around ten. It was downhill to Jackson, about 300 feet downhill. It was a little discouraging to lose a chunk of yesterday’s effort, but after all I wasn’t going very far today. At Jackson, though, I neglected to make the turn that highway 88 makes, so off I went, a mile or so in the wrong direction and over a hill. At least I realized what I’d done in just a mile. Just after Jackson, I spotted a bike shop and stopped to see if they had a toe clip to replace the one I broke on day one. I’m riding with old fashioned rat trap type clips instead of clipless pedals on the theory that there’s less to go wrong when I’m halfway across Nevada. The proprietor had one and gave it to me for free. Not bad - next time I’m asking for pedals. He also gave me some reassurance that Carson Pass would be passable in spite of the snow predicted for tomorrow. I stopped at a very nice market in Pine Grove for a sandwich (very nice; they had Scharfenberger chocolate for sale, always a good sign), then did the last two miles, mostly downhill, to Indian Grinding Rock State Park. 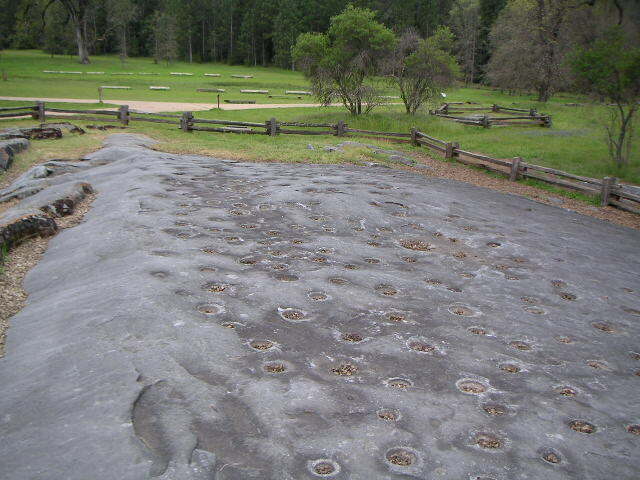 I checked into a campsite and wandered around a bit to see the large flat rock grinding surfaces, covered with man-made hollows, used by a local tribe a couple of millenia ago - and since - to grind acorns into edible meal. When I got back to the campground, I saw the other bike. The campground host had been a little nonplussed when I checked in and told him I was riding to New York. What did he think when Jacob, a student from the north of Germany, showed up half an hour later, also on his way from San Francisco to New York? It turns out he’s taking a considerably different route from mine, but we may be riding together for a few days. The rain started in the early afternoon, so after getting Jacob’s story, I was confined to my tent for dinner, and then read and listened to mp3’s. It rained fairly heavily last night, and although I stayed dry, my tent was a little soggy inside. I can’t tell if it was just condensation or if the tent itself was leaking a bit. It is a bit old, and I don’t remember sealing the seams when I got it a dozen years ago. I have seam sealer with me; when things dry out, I’ll see what can be done. Jacob and I sat (or stood) under a shed picnic structure in the main part of the park to stay out of the rain. We were joined by a couple of guys who worked for the California Youth Authority and who were there for a meeting, but hadn’t been able to get into the park building so early in the morning. One of them had worked for the park at some point in the past, and once found a metal pipe full of twenty dollar gold pieces, apparently secreted by the man who once owned the land the park was on. Supposedly there were more. Jacob and I walked into Pine Grove to get some lunch, do some shopping, and attempt to use the library’s internet access. Unfortunately the library never opened - closed for renovation, we learned later - and we wound up going to the Pine Grove Community Center, which had just had a half dozen computers installed. A big deal in a very small town. We checked e-mail, but there wasn’t any way to upload to the blog, as I have no way to interface between my PDA and a desktop. Naturally we got caught in a heavy shower while walking back to the campsite and got soaked. Not really a problem; I have a fair amount of lightweight non-bicycle clothing with me. The real problem is drying stuff out if the bad weather continues. This is likely to have been the hardest day, and by far, of the entire trip. I am clearly already in considerably better shape after a few days of riding and a day off. Today's ride, though, took us from 2300 feet to 8000 feet, a climb of 5700 feet, possibly the largest single uphill I’ve done in one day (not broken into pieces, that is) and certainly the largest (again, unpunctuated by downhills) while touring fully loaded. 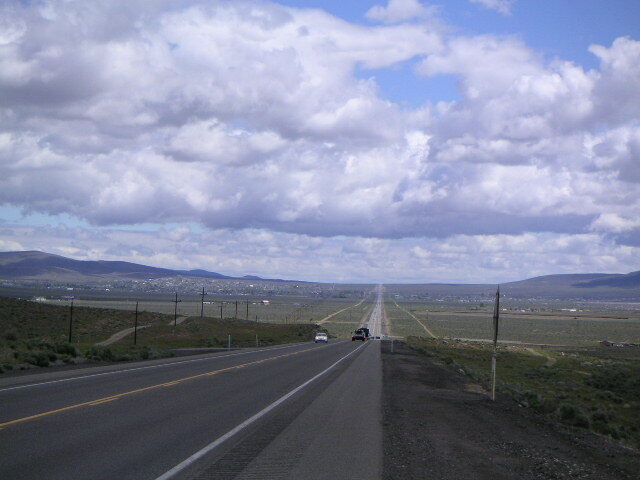 Jacob and I had decided to ride together for a while, but no farther than eastern Nevada, where our routes diverged. So we started off about eight, after determining that the weather on the way up would be good, not knowing how far we’d get that day. As there weren’t going to be any sensible places to stay much above 5000 feet (probably no motels, and camping would involve pitching our tents in the snow - not out of the question, but I wanted to avoid it) it would be best to make it all the way across Carson Pass, or at least to Kirkwood ski area, where there was sure to be lodging. We stopped for lunch at one of the former stage stations, just a shack with a diner, at about 5000 feet. We had done about 20 miles in four hours, about what I expected. As it was just a little after noon, we filled our water bottles and decided to keep going to the top. 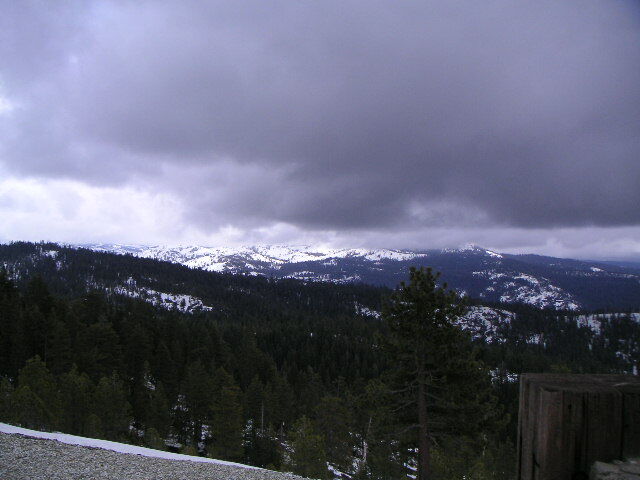 At 6000 feet, patches of snow appeared, and before 7000 feet it covered the ground without break. I was pretty tired, but not nearly so tired as I had been on Kirker Pass Road, on day one. The road now was going up mostly in sweeping curves, occasionally with a passing lane that marked a particularly steep and unrelenting section, up through pines, now with the snow banked by the side of the road where the plows had carved into it. It was certainly raining, but it was never a big problem. We hit a crest at 8000 feet, dropped several hundred feet to the town of Kit Carson, or where Kit Carson was supposed to be, but there was nothing there. 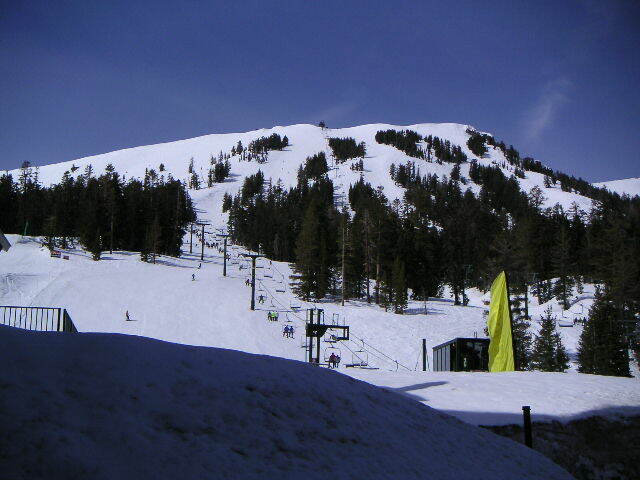 So we pressed on up to 8000 again, then down to 7800 and Kirkwood ski area. I was expecting some motels, but the lodging at Kirkwood seems to be a monopoly owned by the ski area. It was about 6:30 on a Friday evening, but there were almost no cars there. We walked into the lodging office and found out, painfully, just what that monopoly did to the price of a room for the night, in spite of the lack of business. But we had no choice. The room was tiny, but at least it was warm and dry. 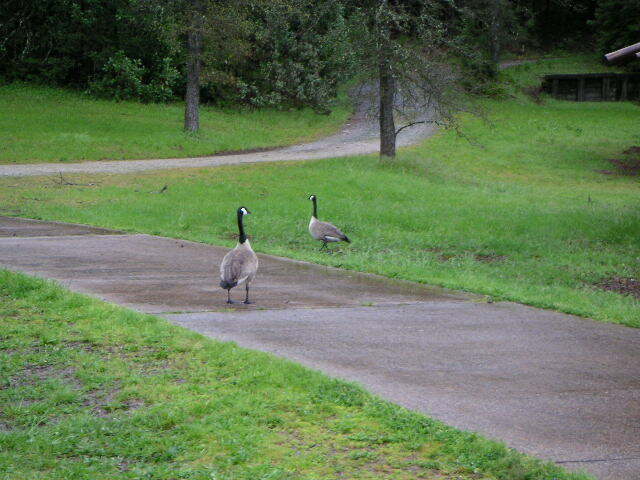 We each had dinner with us, luckily, as everything at the resort was closed. Today would be a short grind up to Carson Pass (8573 feet), although apparently there’s a crest just before the pass that’s at 8800 feet. That would be followed by a long downhill. 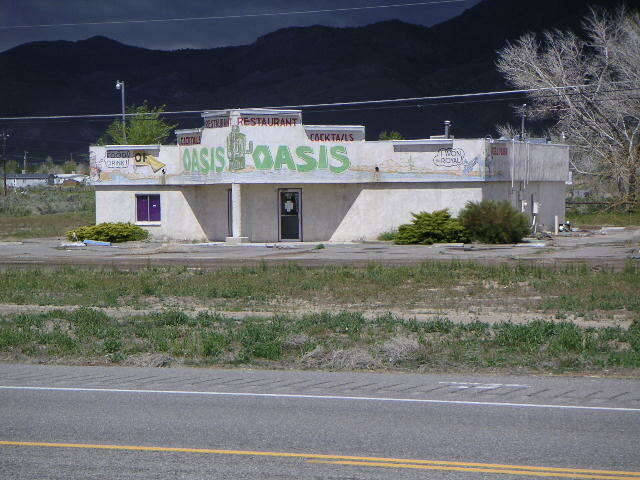 I told Jacob that I wanted to go no farther than Minden, NV, where I wanted to check into a motel and vegetate for a day. As he wanted to go farther, we would separate there, with the slight possibility that I would catch up with him later in Nevada. The downhill was very nice. I had been having a front wheel shimmy at speeds above 20 mph, so at Kirkwood I balanced my front panniers better, removed some weight, and tightened the mounting system. That mostly removed the shimmy, which now appeared a little at 20 mph and then went away as my speed went up. So I allowed myself to hit 35 on the descent, not as fast as I could have easily gone, but at least a reasonable speed for the slope. 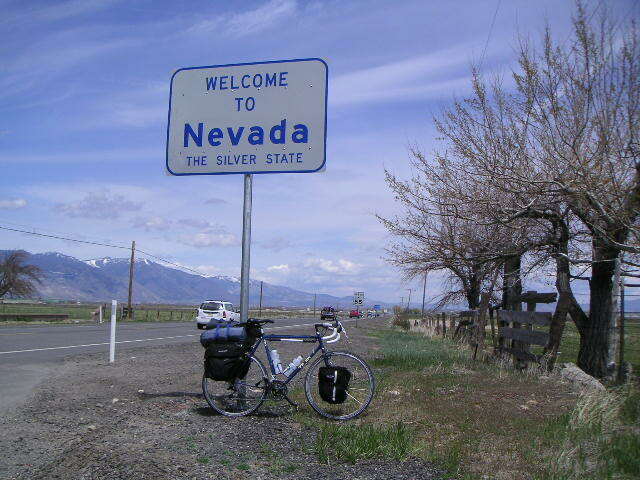 It was flat when we hit Nevada, and at Minden I said goodbye to Jacob and went to look for a motel. Oddly, there were motels but they all had their no vacancy signs lit. The last motel I tried there was a Best Western, where the clerk told me that there was a big girls’ soccer tournament going on that weekend, and that all the rooms from there to Carson CIty would be booked. But he gave me the numbers of some other Best Westerns, and I found a room (a cancellation) a little bit east of downtown Carson City in a casino hotel. So I went on another easy fifteen miles, found the place and checked in. At last, I found a laundromat, and now I have clean riding clothes. I then ate the sort of huge meal you expect to eat at a casino motel in Nevada, and fell asleep bloated. I think that having come this far, I might as well go on to Fallon tomorrow and rest there, as the motel I’m in, while not outrageous, is a little pricey in comparison to what I would have found in the absence of girls’ soccer tournaments. I will begin today by mentioning the soccer mom in the room next door yelling at her daughter at seven on Sunday morning that if she didn’t put on her black socks, they would just go home. I probably should have been out of bed by then, but it was Sunday morning. The goal for the day was Fallon, about 60 miles east over flat terrain, so I didn’t check out until a little after ten. There were two towns on my map between Carson City and Fallon, Dayton and Silver Springs, and I wasn’t expecting much from either one. I had three full water bottles, a couple of Clif bars, and a few other miscellaneous items to eat, so I knew I could make it all the way to Fallon if there was no place for lunch in between. The weather was perfect riding weather. In spite of what both the Weather Channel and the local television forecast had said, I saw no rain, just clouds to keep me out of the sun, and the temperature must have been in the fifties. So I was wearing what I’ve mostly been wearing since San Francisco - wicking fiber t-shirt under jersey, and tights and goretex jacket. Dayton was close enough to Carson City to be a suburb. After 25 miles, I was in Stagecoach, where I bought some fig bars at the gas station market, and looked into the local saloon to ask if there was any place open for lunch. There wasn’t, as the pizza place next door was closed, and the rest of the town appeared to consist only of a few scattered houses and mobile homes and a huge volunteer fire department building. On to Silver Springs,then. The landscape was now pretty empty. There was vegetation everywhere, but nothing was green - just a muted grey all the way to the snow covered mountains in all directions. Somewhere around here is where I saw my first tumbleweeds. It would have been nice if they had been tumbling along behind me - indicating a tailwind, of course - but in fact there was only a light headwind and the tumbleweeds stayed still. Just before Silver Springs there was a sign suggesting that I not stop for hitchhikers because of the prison there. It seemed like a good idea, but I figured that if I was going uphill, a running escapee might be able to catch up to me, knock me off the bike, and have himself the perfect escape vehicle. What state cop would be suspicious of a touring bicyclist? Silver Springs had a casino and therefore lunch was a possibility, but I was only 25 miles from Fallon, not hungry, and I just felt like riding on. Fifteen miles out of Fallon, the countryside started getting greener, there was agriculture (alfalfa and cantaloupes, according to the blurb in my motel room), and traffic picked up. Once in town I quickly found a Comfort Inn, checked in, and went out for an early dinner. Today I did 60 miles in five hours, 12 miles an hour average, with either no wind or a light headwind - this is much more like the kind of speed I expect to be doing the rest of the trip, now that I’m getting back into shape. My plan for Nevada is to stay mostly or entirely in motels. There just isn’t a very good state park system here the way there is in most of the other states I’ll be in. 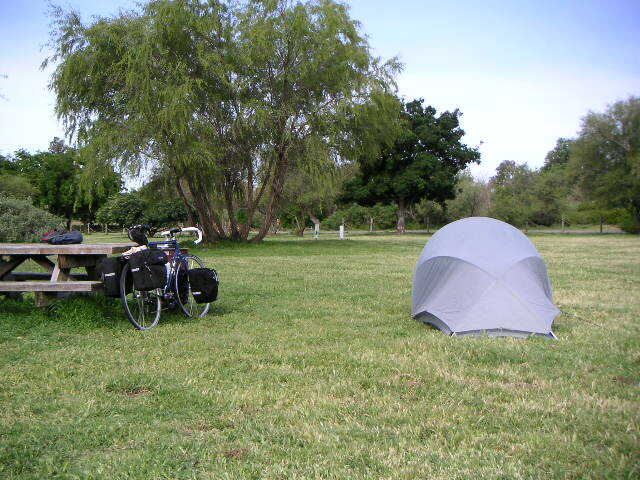 For me, a good state park system means campgrounds with hot showers - I don’t want to ride 60 or 100 miles and then get into a sleeping bag without having had a shower, if I can avoid it. And although my original thought was to go for cheap motels (when I stay in them) to save a few dollars, I’ve now decided that there’s no reason not to spring for a little comfort on this trip. Tomorrow will be a rest day. My motel room has a huge easy chair on which I can collapse and watch Queer Eye for the Straight Guy. I’m not sure those guys would approve of the chair, though.